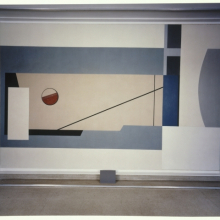 Balcomb Greene’s mural, painted in a palette of grayish blues and warm ivory tones, is characterized by a sense of order, space, and openness. 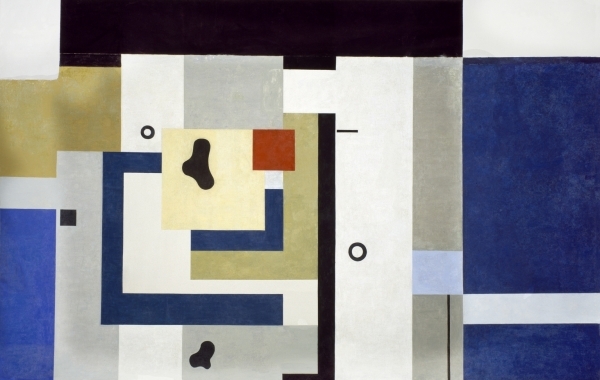 Works such as this one, which he later called his “straight-line, flat paintings,” were influenced by Piet Mondrian and the Abstraction-Creation group, artists who emphasized pure elements such as line, color, and shape, and rejected recognizable subject matter and narrative elements. During the 1930s, Greene supported himself as a commercial artist, writer, and editor. He produced three murals for the WPA, a significant boost to his career at a time few opportunities existed to exhibit or sell his work. Sadly, in 1940, a fire in his studio destroyed most of his work, as well as that of his studio-mate Albert Swinden. His Williamsburg mural remains, then, as a rare example of his early work as well as one of his most important canvases. Paul Kelpe’s murals were designed for a wall space interrupted by a doorway and support columns. The intricate compositions incorporate a multiplicity of flatly painted geometric forms—lines, circles, triangles, rectangles, and trapezoids, some with curved or cut-off edges—with abstract surface patterning suggesting bubbles, stripes, or grids. Kelpe’s axial layering—unusual among New York’s abstract artists—was inspired by Russian and German constructivism, especially works by Kurt Schwitters, Wassily Kandinsky, and El Lizzitsky that he viewed during his student years in Hanover, Germany. 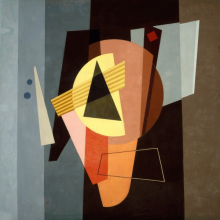 After emigrating to Chicago in 1925, Kelpe eventually made his way to New York, where he worked for the WPA and became active in the American Abstract Artists group. Later, he worked as an art history professor before retiring to Austin, Texas, in 1969. Of the five Williamsburg murals currently on view, Kelpe’s were the only ones that were rescued intact; the other three had been painted over long ago, well before their rediscovery in 1990. Ilya Bolotowsky’s Williamsburg mural was, in his words, “designed to improve proportions in a very shallow day room.” He achieved this with a light-colored background against which vibrantly colored geometric and biomorphic shapes hover in the air in tension with one another. The horizontal emphasis, punctuated by strong diagonals, suggests an expansive space not limited by the actual proportions of the room. 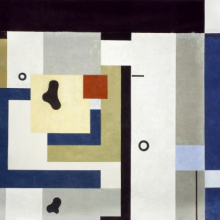 The mural mixed geometric elements with biomorphic shapes, the biggest influence being Piet Mondrian’s paintings, which incorporated primary colors with neutrals in a complex arrangement of contrasting shapes, lines, and colors, to emphasize visual order, harmony, and balance. 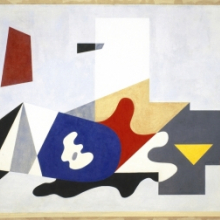 Bolotowsky’s employment with the WPA Mural Division was one of the most important phases of his early career, affording him not only a stable job during the Great Depression but also the opportunity to work with artists and designers dedicated to abstraction at a time when it was virtually unknown in the United States. The exceptional murals installed in this area, executed by the pioneer American abstractionists Ilya Bolotowsky, Balcomb Greene, Paul Kelpe, and Albert Swinden, were commissioned by the Works Progress Administration/Federal Art Project in 1936 for Brooklyn’s Williamsburg Houses, one of the earliest and best public housing projects in New York City. Designed by pioneering modernist architect William Lescaze, the four-story houses included basement community rooms decorated with murals in “abstract and stimulating patterns” designed to aid relaxation. Burgoyne Diller, the New York head of the Mural Division, recruited younger, innovative artists for the project, reiterating Lescaze’s viewpoint that standard realist subject matter, which celebrated productivity, would not be a source of relaxation for waterfront and factory workers. While the prevailing subject matter in American art—and especially WPA-funded works—centered on narrative scenes of American life, these murals were virtually unique, in that they were the first non-objective public murals in the United States, containing no recognizable figures, symbols, or objects. Fortunately, though the murals suffered from neglect over the years, they were rediscovered in the late 1980s under layers of paint. After a painstaking restoration, they were returned to public view at the Brooklyn Museum, on long-term loan from the New York City Housing Authority. The Lost Murals of Williamsburg Houses (1990), directed by Jeffrey C. Wisotsky for the New York City Housing Authority.